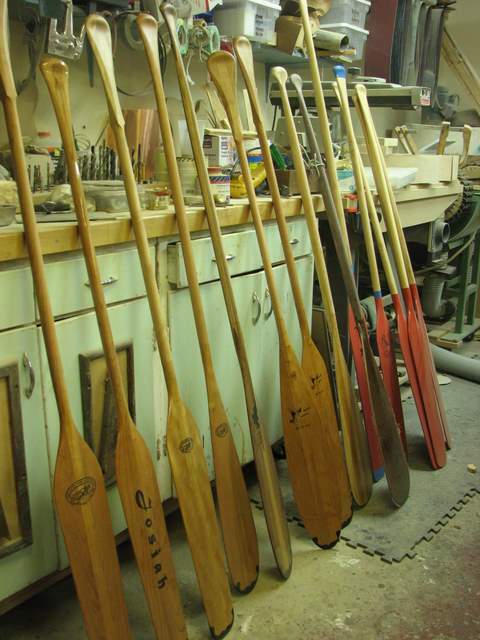 Here's a peek at the April harvest of new paddles. RRC&P for Red River Canoe & Paddle. To enable non literate workers to identify where the cargo is supposed to arrive, the fur trade companies had a series of symbols for each trading post, or Factory-the head of which is called a Factor. The grasshopper represented Red River Settlement-present day Winnipeg. the Crocus is for Manitoba. I have no idea what the symbols actually looked at so I came up with these. 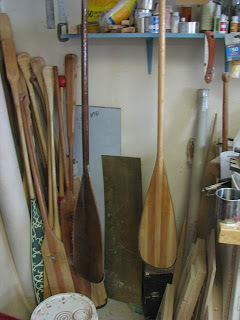 Including the completion of two Freestyle paddles that I had started last year on spec but never got around to completing. One is walnut and dark Red Cedar, the other is curly Maple and White Cedar. Here they are hanging to allow the epoxy coating the 2oz. fiberglass skins to cure. 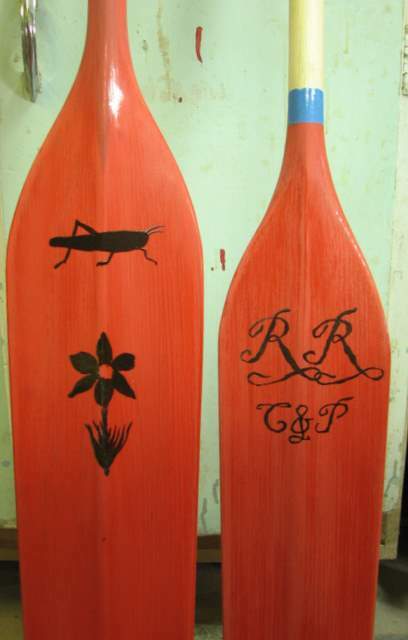 Two of the paddles are wedding gifts from the grooms parents. 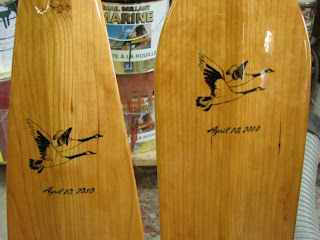 The image of the geese is based upon a graphic that appeared upon the wedding invitation, the date is, well its THE date. 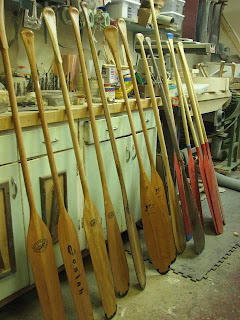 That Edmonton walnut paddle came out like this. 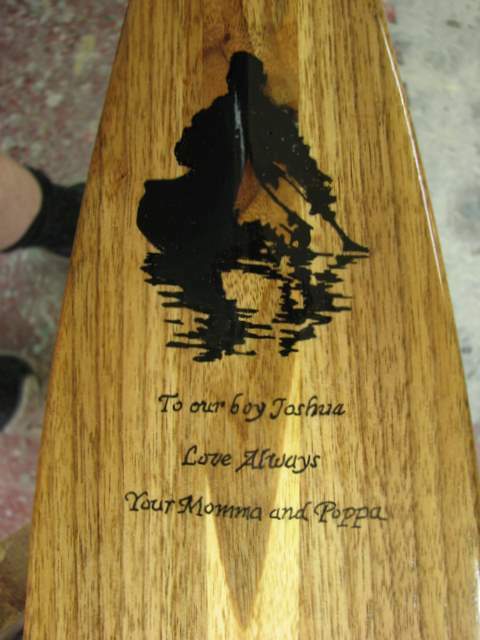 The client commissioned it for his son, just because he and his wife are proud of him. The Walnut came from the family farm, so it has significant sentimental value. 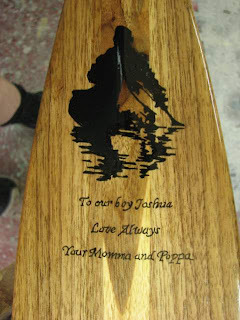 There is just enough to get one more paddle out of it, and that will be for the client's brother. gorgeous graphic on the walnut, doug. Nice ink. You could branch into the tattoo flash business, if you got tired of paddles, canoes and guitars. August 15, 2011 at 9:54 p.m.